Schools do not stress history much these days, but most people know that Jesus Christ was born in the reign of Caesar Octavian Augustus. Catholic historians teach that the peace of Augustus was one of the main conditions that permitted the initial spread of Christianity. But Augustus did not inherit this era of peace. The opposite was true. What he came into after the death of his predecessor, Julius Caesar, was a situation of extreme disorder and demoralization in every sphere of life. Revolution and war were rife, the morals and family life of Rome were deteriorating, the idolatrous state religion was in decline and Eastern mystery religions were spreading to fill the void. It was an age ripe for the true Savior, the true God who would restore not only authority and order, but bring supernatural grace and install Faith, Hope, and Charity, and thus offer a sense of purpose in this earthly life. Throughout the first century BC there was a great spread of Messianic ideas not only among the Jewish people, who knew from the Prophets and signs in the heavens that the birth of their King was imminent, but also among the Roman people. Providence permitted signs and prophecies throughout the Roman world presaging the birth of the Savior of the world. For example, in 40 BC, Virgil wrote his haunting Fourth Eclogue, in which he presented a vision of a “golden age” soon to come with the birth of a Child born of a Virgin. And so, when Octavian Augustus began to consolidate the Empire, revive Roman traditions and religion, and establish policies that would bring about his famous peace, it was not surprising that in the Roman Empire, which was accustomed to deifying its Emperors, he was hailed by many as that great deliverer. Documents as early as the 6th century record that upon hearing these words, the Emperor paid homage and lay prostrate before this marvellous vision. He ordered an imperial altar erected on that very site. It was called the Ara Coeli - the Altar of the Heavens, an altar dedicated to the future Infant-God prophesied to be born during the reign of Augustus. Octavian Augustus, who later accepted and even encouraged his own deification, is remembered by no one as god or savior. 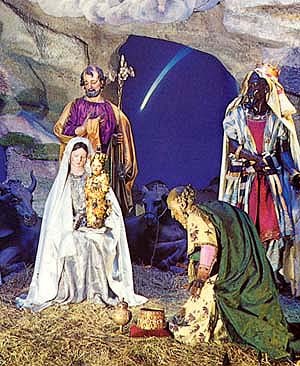 But the altar he erected in Rome for the future Infant-God remains today to commemorate the King of Kings born in his reign. The temple to the goddess Juno where the Emperor saw the vision is one of the ruins of history. 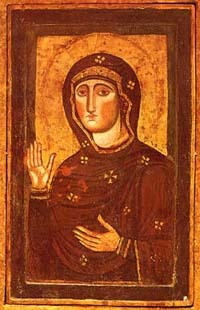 But over that site, a Catholic Church was built dedicated to the Mother of God: Santa Maria in Ara Coeli. Here, on what seems to be the highest hill of Rome, stands a symbol of the triumph of Christianity over Paganism. One senses this still today, especially during the Advent and Christmas season, when Santa Maria in Ara Coeli becomes the center of celebration of the birth of Christ. For this is where one finds the Santo Bambino, beloved by Romans and pilgrims who have the good fortune, as I did, to visit there. 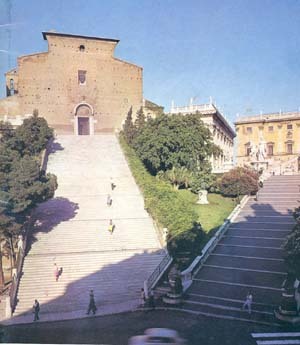 Ara Coeli was on my list of “must visit” places in Rome for two reasons: to see the altar built by the Emperor still preserved there, and to venerate a fresco of the Blessed Virgin that tradition tells us was painted by St. Luke, the Madonna di Ara Coeli. I knew nothing of the Chapel of the Santo Bambino. I was overwhelmed entering this minor basilica that seems so plain on the outside but sparkles to distraction on the inside with its gilded paneled ceiling built to commemorate the victory of Lepanto, and its triple naves filled with paintings from every era. It was not long, however, before my attention was captured by the piece in a side chapel that ends by dominating Santa Maria in Ara Coeli. It is the life size statue of the Infant Jesus carved from olive-wood from Gethsemane by a Franciscan friar in Jerusalem at the end of 1400. According to tradition, its coloring was completed by the hand of an angel. Truly it seems an angelic work, because the ruddy skin of the chubby faced Infant shines and glows with a translucence that is beyond human skill to achieve. Seeing the Santo Bambino [Holy Infant], I felt the natural joy one feels in the presence of the innocence of a baby, a joy intensified by the sense that this is an Infant like no other. I had an overwhelming urge to touch Him, to embrace Him, to draw near this Divine Bambino and share a bit of the sweetness and sanctity that radiate from this statue. This impulse toward intimacy might seem presumptuous to a puritanical spirit, which the Roman, whatever his faults may be, does not have. 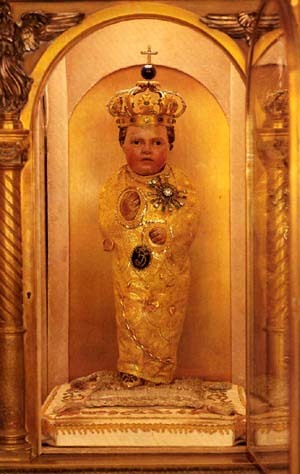 Through the centuries, the people of Rome have embraced their beloved Santo Bambino. It is a long held tradition for persons who become sick to call for the Santo Bambino, and, until recently, he was transported to their bedsides in a gilded carriage donated by the people of Rome. (Even the sacred statue has felt the de-sacralizing effects of Vatican II and must now travel by simpler coach). The miraculous cures have been many. The custom soon formed for pilgrims and devotees to give gifts of jewels to the Infant Christ, which have adorned the gown of the wooden statue from head to toe. But the Divine Child cannot be outdone in generosity. From time to time after floods or natural disasters in Rome, the jewels have been sold to fund relief efforts. “If you wish to be truly Roman, you must love the Santo Bambino,” the people say. On Christmas night, I am told, the Church of Ara Coeli is a marvel. It can seem that most of Rome is climbing the 124 steps as bagpipers play traditional medieval tunes before the church door. Inside chandeliers and tapers blaze, transporting the churchgoers to another era. At midnight the Santo Bambino is brought from his private Chapel to a ceremonial baroque throne before the high altar. When the Gloria is sung, the veil is taken away, and the statue is processed to his special Chapel of the Creche in the left nave. I have not seen the procession, but I can imagine it. An Italian pandemonium breaks out as everyone jostles to get a better look or edge a little closer. And the “lucky ones” actually touch the statue itself. Then, from Christmas to Epiphany, the Santo Bambino can be visited in state, in his Chapel of the Creche, open only for this brief season. There He sits on the lap of the Virgin, accessible to all, in the creche scene with dressed life-size figures. This is the time when the children come to pay homage to the Christ Child. A wooden pulpit across from the presepio is set up for them so that they can recite poems, prayers, or requests before their little King. It is charming Catholic traditions like these, born organically from the natural enthusiasm and devotion of a people, that nourish intimacy between the inhabitants of Heaven and Earth. Two thousand years after the birth of Christ, we come before His simple creche. We do not have the good fortune to be in Rome. But then, we know that the Rome of today is suffering from the same moral deterioration and lack of faith as the rest of the world. For those who truly love Ages Bambino, it is futile to try to forget or ignore the crisis in the Church or disguise the gravity of the hour. Kneeling before Divine Infant, we realize that the reform of the Church requires something personal, the reform of man – not considered in the abstract, but rather, my own personal reform, my own conversion in customs as well as the spiritual life. This is what Our Lady called for at Anima as an essential and indispensable part of the conditions for a Catholic restoration. It is the moment to beg pardon for our sins and past concessions to the Revolution, to ask for the courage and perseverance to remain in the fight for the Church until the victory. Then, having made this act of generosity and combativity, we can be serene and confident. Let each one do his part in the fight, certain that the Santo Bambino will supply the rest for the triumph to come that His Blessed Mother promised at Fatima.